Each PhotoPoem picture is done through a special print process. Original raw data is placed on a single disc, scanned for accuracy, then progected on to special paper using a high intensity laser printer. 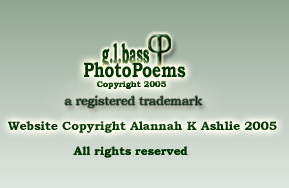 For more information and to place an order you may e-mail me directly at poetlor@aol.com Thanks for veiwing PhotoPoems, from the The Ghostbear*! !